If you are looking for a top notch party hostel within accessible distance to all of Krabisâ€™ famous attractions while paying a budget price then you are at the right place! 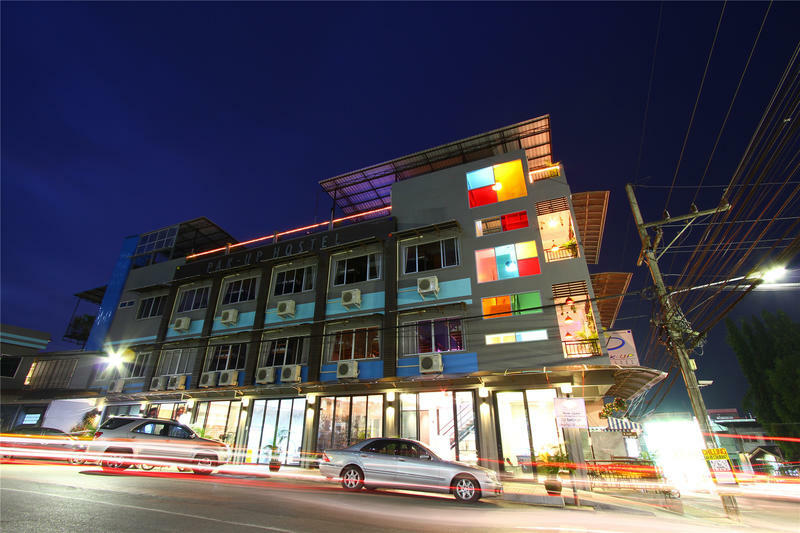 At Pak Up, we work hard to ensure every detail is right and the place is spotlessly clean, beds are comfy while providing all the best nightlife Krabi Town has to offer within our safe and secure premises. Pak Up management strives to go from strength to strength, keeping up with all the new global trends in the world of properties and budget travel. When you arrive, you will notice this is nothing like the run of the mill property you will typically find in SE Asia. As a former school, the property is themed accordingly room by room and is in a loft style oversized setting. All our rooms are set to the same standard, with international plugs, reading lights, under-bed lockers, bed shelves, towel rails and 3.5 ft beds. From the ground floor reception, to the fourth floor Top-Up Bar (Sky Bar) and back down to the Playground Bar downstairs, this place is designed to impress. During the day you will be able to either take advantage of the many tours available at our reception desk or just chill out on one of the many terraces dotted all over the property. Our tour desk offers a seamless way to see everything in Krabi at a reasonable price and you will never be left stranded anywhere. Our staff are trained to make sure you avoid stress. Playground, as the name suggests, is a place for big kids like us to socialize, drink, play, and generally acquire great memories along with great friends from day one. The staff will strive to offer the very best in property entertainment with great deals on whenever you care to visit our bars. Top-Up bar, with its panoramic views, superb mixologists and breezy feel, is a place to escape after a long day travelling. We have a weekly schedule posted in the lobby with daily activities in one of the bars. These are usually competitive and involve a lot of drinking! The hostel is right in the middle of the town. - Shuttle bus: You can take the shuttle bus from/to the airport. It takes 45 mins. At the airport, there is the shuttle bus counter at the arrival hall after you collect your bags. From the hostel, you can book the shuttle bus ticket from reception. The shuttle bus will pick you up in front of the hostel. - Taxi: 150 baht and takes 15 mins. - To the port: You can get the ferry ticket from reception,. A free pick up service is included. - From the port: Normally the boat company offers drop off service for 50 baht per person. Accessible only by boat due to the high limestone cliffs cutting off mainland access. - Chao Fa Pier: 1 min walk from the hostel. The pier is just right in front of the hostel and takes 30 mins. The boat ride costs 150 baht one way. You can get the ticket from reception. - Song Tiew(local transportation): you can wait for the bus at the opposite of the hostel. It takes 45 mins. The bus comes every 10 mins on weekdays. Every 30 mins at weekend. From Ao Nang, the bus will drop you off in front of the hostel. - By motorbike: you can hire a motorbike and ride to Ao Nang. It is 18km from Krabi town and takes 30 mins.